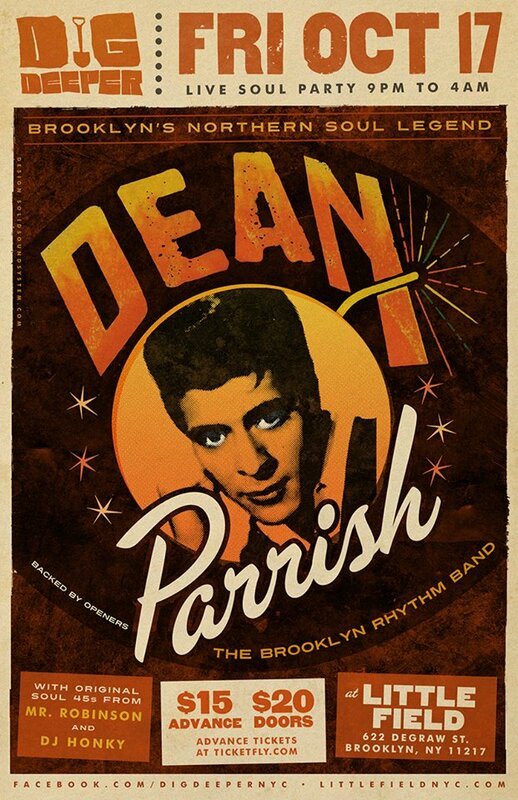 The history of Dean Parrish is almost too Sugar Man-like to be credible: Born Phil Anastasia, in 1964 he changed his name to Dean Parrish and had a moderate career as recording artist, scoring minor hits with songs such as “I’m On My Way”, “Tell Her”, “Determination”, “Skate”, and “Bricks, Broken Bottles and Sticks”. In 1967 Parrish reverted to his original name, and moved into the acting business. Nothing unusual thus far. But in the mid 1970s he became big on the British Northern Soul scene, with his majestic “I’m On My Way” being the last record ever to be played at the legendary Northern Soul Mecca Wigan Casino. The song subsequently became a bestseller in Britain. This Parrish apparently was unaware of, and due to his name change back to Anastasia, he couldn’t be tracked down. First in 2001, Parrish was connected with people from the British Northern Soul, and he then went on tour there. A couple of years ago, together with Lord Large, he recorded an old, never before recorded, Paul Weller song, “Left Right & Centre” (with the video using old clips from Wigan Casino). Which brings us up-to-date. Last night Parrish played the wonderful club Dig Deeper here in Brooklyn. At Dig Deeper, together with the house band The Brooklyn Rhythm Band, soul singers from the 60s, who in many occasions have not performed for ages, get onstage to sing their old songs. And last night Parrish took the stage. It was not his first time here. But he does not play often, and Brits had flown in from Britain to catch the event. Of course I had never seen him live before either. It was a moving performance. Stylishly dressed, with full control over his voice, and quite clearly touched by the crowd reactions, mister Parrish moved from rousing versions of uptempo songs like “Tell Him” and “Do I Love You (Indeed I Do)” to the more tender and wistful “Bricks, Broken Bottles and Sticks” (dedicated to his hometown Brooklyn). But the highlight of any Dean Parrish performance is for obvious reasons “I’m on My Way”, which he did twice. Below you can see the evening’s first version of the song. As the emcee wound up the evening with saying: “This is New York City Soul Music”.